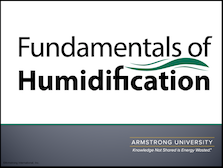 What humidification is and why it is important. Understand the problems associated with low humidity. Learn how to determine humidity requirements. Understand how Psychrometrics are used in humidification design, and learn about the different methods of humidification-Isothermal and Adiabatic.